It’s true that one of the most popular off season workouts involves watching YouTube and drinking beer. 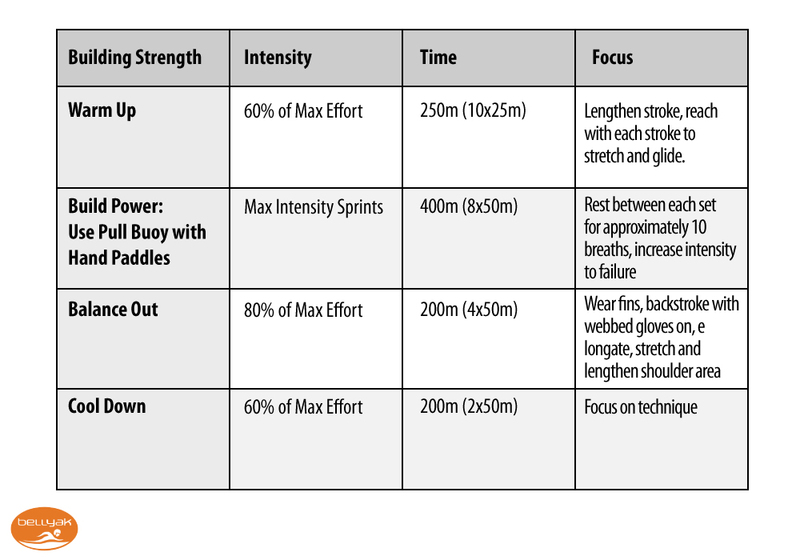 While this is one of the top training methods for marginal athletic performance, this approach results in startling feelings of being out of shape after a long cold winter. We suggest another route: intentional training for the activity at hand. 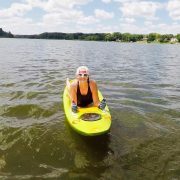 Taking time in the off-season to fully focus on whitewater prone paddling training will allow you to have MAXIMUM FUN during the warmer months. 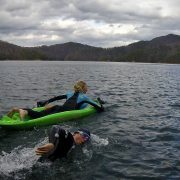 Paddling, aside from all-out racing, is characterized by periods of intense exertion followed by recovery. 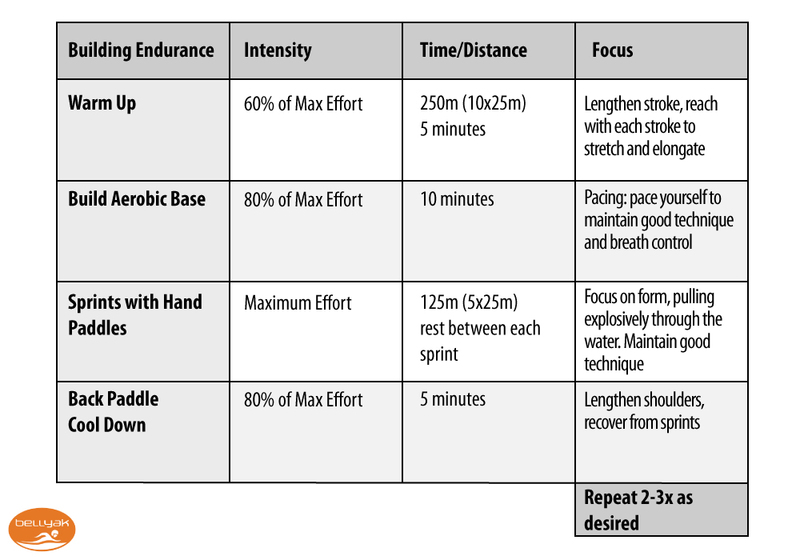 Therefore, training should mimic this: Sprints to failure, followed by rest. The goal is to reduce the amount of time it takes to get your heart rate back down after a sustained effort so that you can stay calm, focused, and go for longer. Simple! The pool. 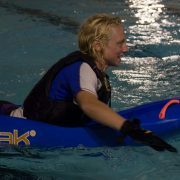 The pool is a super accessible, always available option to brush up your training and get ready for whitewater. Having a plan before you go will allow you to swim with a purpose, thus increasing the focus and results of your workout. As you’re training, imagine you are in the river on your boat and PUSH YOURSELF. The pool is a safe space for going hard so when you’re in the river and there are thousands of other sensory stimuli around you, you can focus on the FUN and TECHNIQUE of bellyak, and less on the lactic acid overdose you may experience. 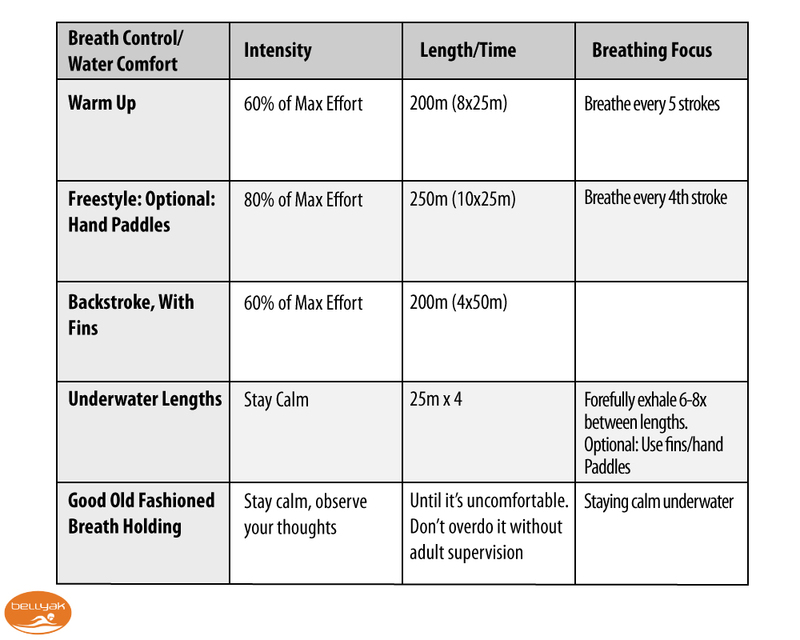 Pool sessions are also a great way to practice STAYING CALM in a safe environment, allowing you to push yourself a little past your comfort level each session. 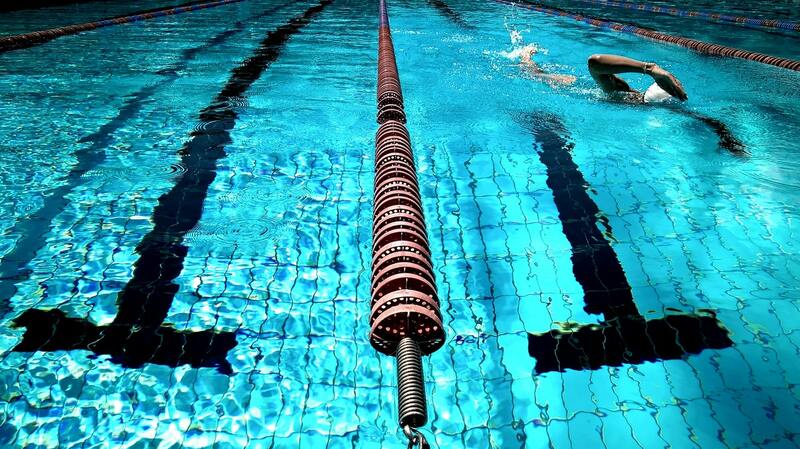 Strive for a 1% improvement each time you get in the pool. Never underestimate the power of the five yard pass. Small gains over time lead to real results. This is putting money in the bank. You are building your savings so that when you have to withdraw, you have enough deposits on hand to cover your efforts. 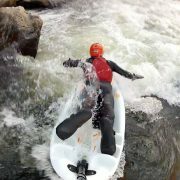 The key to success in all paddlesports is conquering the mental game. 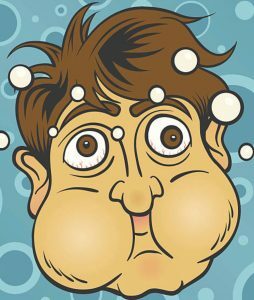 This will help you control your thoughts by controlling your breath. The distances shown are a guideline. Go more or less depending on how you feel. It’s better to focus on QUALITY of effort rather than just distance or time. Anything aerobic is not only good for your heart and encouraged by every trashy fitness magazine at the grocery store, it also builds endurance for longer paddling trips. 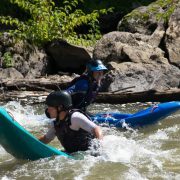 Running, mountain unicycling, competitive eating, Jacobs Ladder, and bull riding all help develop the lung capacity that allows you to progress from paddling for 30 minutes to completing 13 mile runs such as the Lower Gauley. 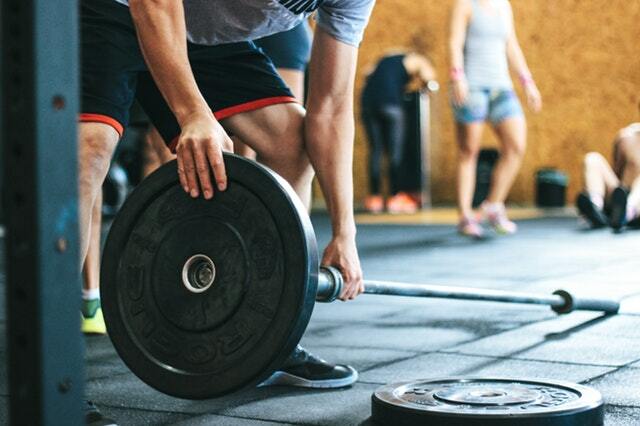 Weight programs should be designed to work on complementary muscle groups. Free weights are an excellent way to build joint stability and strength through the entire range of motion. Shoulder presses, bicep curls, tricep kickbacks, are all good options. Pushups: Do 100 per day, in sets of however many you can do. This is a good habit for life. Situps: Do 100 per day, in sets of however many you can do. Mix it up with crunches, pilates, getting off the couch, V-ups, etc. 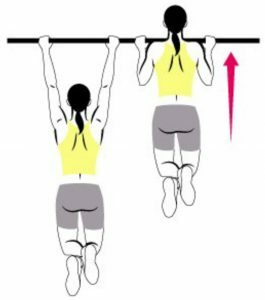 Pull-ups: Develop not only endurance but Explosive Power that allows you to drop into turbo torque catch the wave mode. PLAY: Use your river time as your play time, and get the secondary benefits of doing the work. Specific training throughout the season will just allow you to have more fun. And he who has the most fun, always wins. 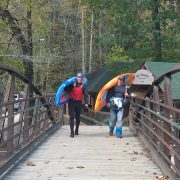 Five Hidden Gems to Paddle in Western North Carolina April Fools!